Dost thou verily understandeth the KJV? You read the book, now watch the new movie based on Authorized by Mark Ward. The King James Version is the most widely read Bible in the United States. But over the last 400 years, English has changed in subtle ways few modern readers will recognize. How much of it do we really understand today? What we think we know may be more dangerous than what we don’t. Watch the movie with a free trial to Faithlife TV Plus. 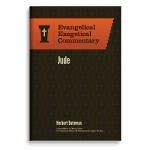 Get a Free Volume from the Evangelical Exegetical Commentary! Maybe I knoweth it not.